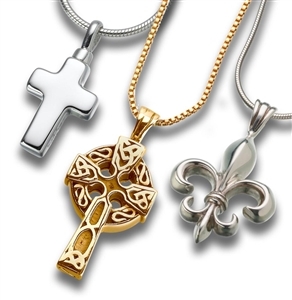 Of all the products used to memorialize a departed pet, pet cremation jewelry has grown to be one of the most popular. As with cremation jewelry for humans, pet cremation pendants are designed to store a very small portion of the cremated remains inside a small compartment and sealed with a small screw. Pet urn jewelry is the perfect memorial for keeping your cherished pet close to your heart at all times. A variety of unique and styles and shapes. 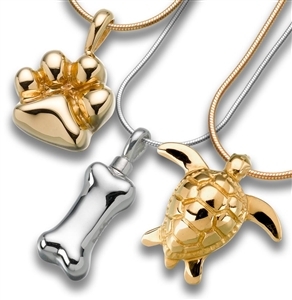 Pet memorial jewelry pendants are made in a wide assortment of shapes, designs and metal finishes. You will find precious designs such as dog cremation jewelry, cat cremation jewelry, paw print pendants and yarn ball pendants. 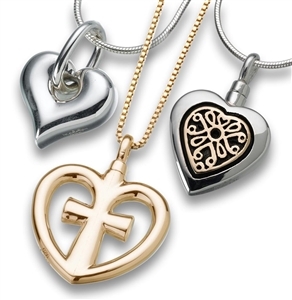 Many shapes for pet urn pendants include pet heart pendants, pet cross pendants and pet star pendants to name a few. Your pet keepsake jewelry comes in a host of metal finishes such as exquisitely polished 14kt gold pet urn pendants, sterling silver pet urn pendants, brass pet urn pendants and pewter pet urns pendants. 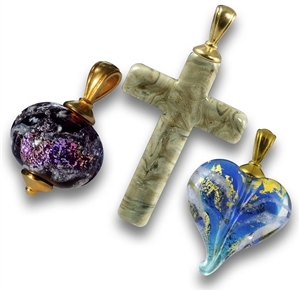 Other finishes include gold plated and enameled pet urn pendants. Each pet keepsake jewelry pendant comes with a funnel to assist in filling it with ashes. You can also find instructions for filling your pet cremation jewelry pendant here. Storing your pet cremation jewelry is easy with a cremation pendant dome display unit design to proudly exhibit your jewelry pendant when not being worn. Placing an order for pet cremation jewelry is very easy, especially since the advent of the Internet. At the Everlife Memorials website you can easily navigate to the pet keepsake pendant you want, choose the options you desire, and then proceed to our easy 1 page checkout to pay for the jewelry piece and receive a confirmation number. Average order time is 2-3 minutes once you decide on the pet memorial jewelry pendant you want. 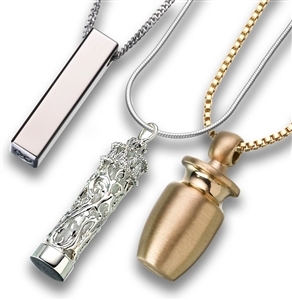 All pet cremation pendants usually ship the same day or within the next business day and can be expedited for quicker delivery with Overnight or 2nd Day delivery. 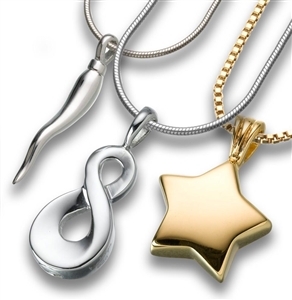 Your pet urn jewelry pendant is guaranteed to meet your satisfaction and can be returned for a *full refund as long as it is in resalable condition. Answer any questions you have about our pet cremation jewelry line. *Satisfaction Guarantee: Pendant must be in resalable condition and cannot have been filled with ashes. Customized jewelry such as thumb print jewelry and glass pendants containing ashes are not covered by this guarantee. Other restrictions may apply. For more details on our return policy, click here.